You’ve been brought up as a Christian in a Christian home and have accepted this faith as your own. This is not a nominal faith; you have chosen to follow Jesus and give your life fully to him. Now as an adult you are married to a fellow Christian, have a son who is nearly two years old and are pregnant with your second child. Your husband is a citizen of another country and you are planning to emigrate. Life where you live is not always easy and you are looking forward to a new start in a place where your children will have far more opportunities available to them as they grow up than will ever be the case if you stay where you are. One day out of nowhere the police arrive at your door, arrest you and throw you into prison. Apparently your half-brother is furious that you have gone your own way, choosing your own husband and are now intending to move abroad. For him this is simply not acceptable behaviour for a woman in his family. He publicly cries “apostasy” and accuses you of converting to Christianity from Islam. The sole justification for this is that your father had been a Muslim, even though he abandoned your mother while you were still young. In law as a woman your faith is legally determined by your father’s. Up until this point such a technicality has had no bearing on your life, but now that a relative has a grudge against you, everything that you have counts for nothing. In your country, to reject Islam is a one of the worst crimes it is possible to commit. It is a direct offence against the Prophet and Allah. To compound this, for a Muslim woman to marry a Christian is illegal; it is another rejection of your religion. Not only are you in jail, but your young son has been incarcerated with you because the authorities regard him as a Muslim and will not allow him to be raised by his Christian father. Two weeks later standing before the judge in the court you display your marriage certificate, which classifies you as Christian, as proof of your religion. Three potential witnesses who have come to testify of your lifelong adherence to Christianity are prevented from giving evidence. All the rational arguments you present are dismissed. At the end of the hearing your marriage is annulled, you are charged with adultery and also apostasy for leaving Islam. Thrown back into prison with your son awaiting sentencing you are refused medical treatment despite being heavily pregnant. No visits are allowed except from Muslim scholars who pressurise you to ‘return’ to the religion of your father. You know that the charges you have been found guilty of receive serious punishments. Even though no one has been executed for apostasy since the penal code was introduced in 1991, the judge is within his powers to hand such a sentence down to you. As you sit there locked up day after day, isolated from your family, seeing your son become increasingly traumatised and knowing a terrible punishment could be in store, at what point do you recant as the scholars are urging you to do and in the process bring about freedom for you and your son even though it goes against everything you believe in? 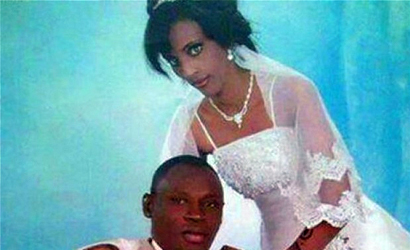 This is of course the story of Meriam Ibrahim and these are the words she spoke. An innocent woman sentenced to a horrific death for doing no more than being a Christian. Many in the world have stood behind her over these last few days. On Saturday there was hope when a Sudanese foreign ministry said she would be released, but within 24 hours the government had backtracked. Having now given birth whilst still in shackles, she awaits the outcome of an appeal that will most likely take months to go through. If it is unsuccessful she has two years to wean her daughter before her life will be brutally ended. With incredible boldness she is willing to sacrifice herself for what she holds most dear. If she cannot follow Jesus then life is not worth living. Sadly there are thousands of others around the world in similar situations, in places where religious freedom is but a distant hope. We cannot save them all, but now that Meriam’s fate has caught our eye we cannot let her go. Only continued international pressure will bring her the release she completely deserves. Meriam’s incredible courage in the face of death is a wake-up call to those of us who take our freedom for granted when there are many crying out for justice around the world. We must not let her case be forgotten until it is resolved. To do so would be to turn our backs not only on her but all those who suffer similarly. To turn our backs is to say we no longer care – that it is someone else’s problem to deal with. For us as individuals, if we can find five minutes to make a coffee, then we have the time to petition the Sudanese Embassy. For those of us with a Christian faith, we have a duty to stand in solidarity with Meriam and pray for her. If our government can pledge to do much good around the world by committing itself to be one of the most generous donors of foreign aid, then it should not be too much to ask to turn our attentions to abuses of human rights around the world confront those countries who persistently abuse religious minorities (including atheists) as well others including gay people and democracy campaigners. Canada has made religious freedom a foreign policy priority and is urging Britain and America to champion the persecuted at the UN and G8. It is a tragedy and brings shame on our country that we are not doing more. Our leaders say repeatedly that we are a Christian country and hold religious freedom and justice in high esteem. It is not the time to give up, but instead to press forward. All of us at individual and government levels need to show Meriam Ibrahim how much we really mean it. Thanks for this thought provoking post. Theres been news about this all over our site. Please feel free to share your blog posts at Godinterest. God Bless Your Ministry. Let us remember that there is more at stake than thought provoking discussions. Two thousand years ago, He sent us an the long expected Messiah who walked among us and took our sins on His shoulders. In Him and through Him we are now in a real struggle to balance the truth and the respect for nature and natural ways. Miriam is an example of the courage that many of us need to spiritually lift ourselves and each other as a sign of the real inheritance, so clearly stated in biblical history. If we forget or fail to spend time in quiet devotion (and contemplation of the Christian teaching), we do so at our own peril and will lose the real purpose of the Father’s eternal love for His children. My sister and I have been shocked at the lack of response of church leadership in asking their people to think about signing a petition to free Meriam Ibrahim; reasons – everything from, ” It might be a hoax,” or, ” we do not get involved or focus our efforts on activism,” or not response at all. I guess silence is golden. So far the petition has accumulated a little over 52,000 and they need a 100,000 by the end of June – wow.